Rug Repair and Reweaving for Brick Township, New Jersey Homeowners. Master craftspeople reweave holes, renap worn areas; restore moth damage; repair seams; reduce a rug's size; rewrap and repair a rug's sides; reweave fringes or add artificial fringes; unravel and overcast worn fringes and patch holes. Our master craftspeople can do almost any type of repair on both antique and contemporary handmade rugs, custom made rugs, machine made rugs such as Karastans and Couristan and broadloom carpet. We do all types of repairs on machine made rugs and broadloom carpet. These types of repairs and alterations are usually less expensive than hand repairs that we do on handmade rugs and carpets. We can sew on new fringes, bind or serge the sides, cut a rug down in size and fabricate rugs by adding borders, decorative bindings, leather etc. to give you a beautifully finished rug. If you have any type of rug or carpet, handmade or machine made we can fix, repair and restore it. Please Do Not Throw Away a Cherished Rug Just Because It Is Worn or Has Been Damaged. Tears, rips, missing and worn fringes, moth damage, missing binding, white knots, worn area and holes don’t mean your rug is ruined. These problems can be repaired and we perform all types of repairs and restore the rug to it’s original condition. Hi, I’m Paul Iskyan. Chances are, your rug can be saved. Call us, send us pictures, have us pick up the rug and we can give you an honest and complete evaluation. At Rug Renovating we work wonders every day. 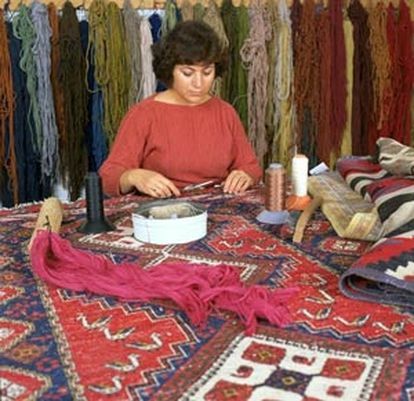 We have a team of 10 – 12 artisans who’s only job, is to repair and restore all types of handmade and machine made rugs and carpets. Speak with one of our service consultants let them advise you as to the proper way to handle your rug’s problems. RUG BLOCKING: When a rug is misshaped or has built-in wrinkles, sizing or rug blocking may help. A rug is resized by flipping it over, making it as square and flat as possible, and securing it along the edges. With their pile sides facing down, we apply natural starch to the backs of the rugs during the stretching and shaping process. Starch helps blocked rugs maintain their newly restored shapes after coming off the board. Note that even a good quality rug is rarely perfectly rectilinear. When blocking a rug the choice is sometimes between getting it flat or making it square--from the standpoint of what's good for the rug, it is almost always better to make the rug flat than to make it perfectly rectilinear. Used with care sizing can make a rug more attractive and usable. 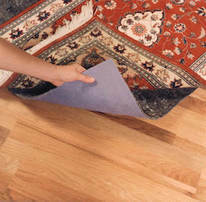 Used incorrectly, blocking can distort or even damage a rug. Over-aggressive blocking will not remedy the problems of a poorly woven rug. Don't try this at home! Sizing or blocking is definitely a process best handled by an experienced rug repair person. A rug pad can make or break the comfort and durability of your rug because it plays a critical role in your rug's performance and appearance. The main purpose of a rug pad is to protect and support your rug's durability and effectiveness. The pad keeps the underside from wearing against the bare floor. It also absorbs the impact from footsteps and furniture, lessening the both the stress on your rug as well as your joints. One study found that rugs without cushioning lose about 19 percent of their pile height from wear and tear as compared to a 5 to 10 percent loss for the same rug with a separate pad. All the pads we offer are custom-cut to fit your rug or to your exact specifications.